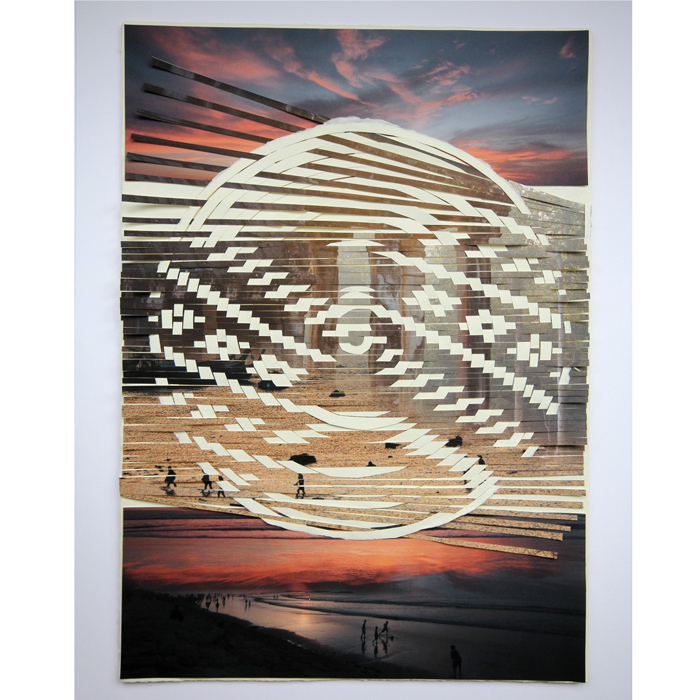 WEAVING WATER is a migrating exhibition in which Native American artist Sarah Sense navigates a new visual language through photography and weaving. The following exhibition launch events are a collaboration between the artist, Rainmaker Gallery and Dr. Max Carocci, curator at the British Museum. Followed by Panel Discussion and Book signing with Sarah Sense and Max Carocci. PHILADELPHIA STREET GALLERY 11th June – 16th June. RAINMAKER GALLERY 18th June – 10th August. THE PARLOUR SHOWROOMS 1st August – 6th August. Sarah Sense creates sublime and complex imagery by weaving digital photographs into the traditional Chitimacha basket designs of her tribe. Through her art and research Sense explores the legacy and dissolution of the craft skills specific to her ancestry and those of other indigenous communities across the world. In WEAVING WATER she traces the migration of peoples criss-crossing rivers and oceans and the resultant dilution, resilience and continuing evolution of culture and identity. Dr Max Carocci, curator at the British Museum. To create this body of work the artist travelled through the islands of the Caribbean and across Southeast Asia. Her dynamic, manipulated, photographic images literally weave together these different domains. Dissolving coastlines and echoing experiences of colonisation and cultural diaspora, diverse perspectives simultaneously co-exist and clash to form fragmenting, floating, woven islands of light, pattern and colour. Idyllic views swell, pitch, disperse and vanish as though claimed by surrounding oceans. “I entered the twenty-seventh country in twenty-four months …. All had been adjusted or removed, leaving me raw and open to the world. I found myself in Northern Thailand weaving a basket with freshly cut bamboo, and realized that for the first time in my life I was weaving a Chitimacha basket, using the same source material from my Native family, but in another continent.” Sarah Sense. Whilst conceiving this exhibition Sense discovered that her Chitimacha ancestors were taken as slaves by the French, who transported captive Indians to colonies in the Caribbean. This reverse trade route was all but absent from the story of slavery until researched and documented in the film Written out of History and the book Native American Adoption, Captivity and Slavery in Changing Contexts edited by Max Carocci. Contextual and supporting material by Max Carocci will be presented alongside the work of the artist. Significantly, WEAVING WATER will premier in Bristol, a city built on the spoils of the slave trade. WEAVING WATER is a multifaceted story of forced and voluntary migration, the creative journey of an artist, her enslaved tribal ancestors and all those who travel by water and ultimately discover the source of their identity, culture and creativity. Symbolising the migration of Native and non-native peoples from ancestral lands WEAVING WATER will migrate to and from various gallery venues in central Bristol, throughout the summer months. In the theme of traveling to understand traditional art forms and purposes, I have continued the research. Through this process, a deeper understanding of the search has been lifted from the masked source material, unveiling the source as the purpose. As the first journey came to an end, I felt closer to the natural environment. I realized that Earth and I breathed the same breath and our hearts beat to the same pulse. It had become a transformative learning experience that brought me to being most comfortable when I was traveling and meeting new countries and other cultures to further prove this new idea that had filled my head and entered my weaving. I began to take interest in islands and the small plots of earth surrounded by water, and the ways which migration of culture moved by canoe and later by boats. WEAVING WATER was first explored in the Caribbean Islands with the intention of then transitioning immediately to Southeast Asia where the islands smash together religions, Indigenaity and a plethora of cultures. The jarring clash of America with Asia was initially painfully confusing and had my head spinning in an unpredictable way. I entered the twenty-seventh country in twenty-four months while in Asia and then realized that I had completely lost touch with any definition of self that had been labeled by society or personal beliefs that I once felt in my core. All had been adjusted or removed, leaving me raw and open to the world. I found myself in Northern Thailand weaving a basket with freshly cut bamboo, and realized that for the first time in my life I was weaving a Chitimacha basket with the same source material from my Native family, but in another continent. I thought of the river cane from my reservation in Louisiana and was filled with a blank mind. Everything stopped and felt calm. The next night I slipped into a deep dream during shallow sleep and saw bamboo reed sprout from the earth and weave itself into a basket while growing. Life transformed rapidly with flowers budding to full bloom in seconds. Two days later I was meeting with the Master Paper Maker, Mr. Supan of Lampang, Thailand and was conversing about quantum physics and the instability of all things in life and how like life, the paper has two sides. I stood in his studio, surrounded by a bamboo forest and learned of his paper making process. Suddenly I realized the importance of the source material. I took with me paper that reminded me of the moon, both the front and the back, one side lit by the sun and the other in the shadow. I gathered my images from the recent journey through the islands of America and Asia and considered the repeat of patterns in my work and how I had seen them in Asia and the Caribbean. I thought of the Caribbean’s African culture, slave routes, and of Indigenous slaves from North America into the Islands. I learned of my ancestors being traded by colonizers and plantation owners, relocating them to the French Islands of Martinique and Guadeloupe, coming to realize why Guadeloupe had in some way been frightening to me. Being there made me nervous and scared, later to learn that the island was a grave of distant relatives who had been taken from Louisiana and sent as slaves to Guadeloupe.